How should we deal with controversial names and monuments as our country grows and changes over time? From schools to monuments, this has become a topic across the country. This week’s current event looks at regional and international situations. CLP: Good reminder that this is a national issue, not one limited to one region of the country. The debate on whether the school should be named (along with another campus named after fellow confederate Robert E. Lee) went on for about two years. During a public hearing in 2016, 10 voted in favor for renaming the buildings while 31 voted against it. But, then the Charlottesville rally happened, changing the political and racial climate in a significant way. CLP: New York City’s approach to controversial monuments of historical figures. More background in earlier article below. The move could have implications across the city as conversations continue over controversial namesakes — from Woodrow Wilson High School to Harvey Scott K-8 School. Several of the city’s approximately 80 schools are named after local or national historical figures with controversial track records. 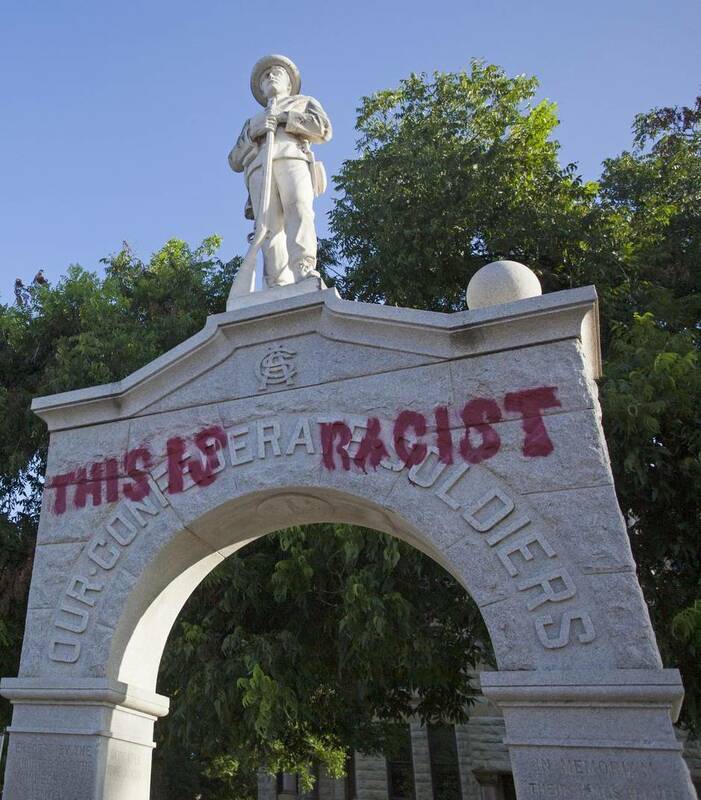 CLP: Impact of renaming and/or removing monuments on races for office. CLP: Examines the shift in public perspective following Charlottesville. Can a name promote pride? Can a name create hurtful memories? Does naming honor a person? Does naming reflect history? How do we reconcile historical events and modern sensibilities? What actions do we take to recognize injustice? What are the alternatives to renaming a monument, school, street when there is a recent look at the honoree? Do some historical monuments belong in museums rather than being renamed? Should renaming be accompanied by an educational campaign which honors various points of view? Is there any difference between naming a monument, a building, a school and an athletic team? Does renaming allow us to feel that we have confronted injustice? Do we take an in depth look at injustice as an historical mandate? Why is this so complicated? Is it ‘TOO EASY TO FEEL INNOCENT’? How is “harm” a relevant concept in deciding the way forward? What are the arguments that opponents of renaming make? Is facing difficult history our responsibility? Why or why not? What is the meaning of a monument? What is the history of Confederate monuments? When were the Confederate monuments installed? How can monuments be used to teach the history of African Americans in the United States? Is it important for all Americans to be aware of the history of slavery and civil rights and police-minority relations? Why? How can monuments be used to learn history? Where should monuments be placed to provide reminders of the past? Why do monuments mean different things to different people? 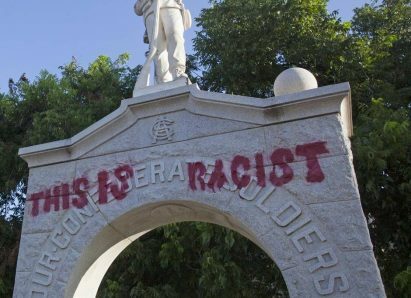 Does removing monuments remove feelings of hate and fear? What actions can be taken to promote dialogue? What do people say about the value of monuments? What is media literacy? Why is literacy important in understanding the monument issue? Should school boards consider renaming schools with Confederate names? Why or why not? Who has jurisdiction over monuments: federal or state governments? Are there special considerations for naming or renaming schools? What is a fair process for deciding which names should be replaced? What are other options to deal with names that evoke pain and unjust behavior? Why is renaming such an emotional issue? How can renaming also be a rethinking moment? While the events in Charlottesville were tragic and have shaken many people’s idea of where we are as a country, a resilient spirit and determination to hold true to America’s democratic values of liberty and equality have also been exhibited over the last week. Do you think tragedies like Charlottesville may create an opportunity to discuss the effects of slavery in American history, including racism and the rise of white supremacy groups, in classrooms across the country? Explain your answer. If you are not sure about the history and meaning of white nationalism or the rise of white supremacy groups, there is a good chance that other students in your class may not be either. What questions would you like to ask about this issue? If your teacher is not sure how to answer a specific question, which could be the case given the sensitivity of the topic, what could he or she do so that your class could continue a healthy dialogue? “On Monday’s Fox and Friends, Condoleezza Rice criticized efforts to tear down statues and monuments to U.S. historical figures who owned slaves. CLP: Offers suggested principles for renaming building. CLP: Great list of resources! CLP: Examines what happens when a name is changed, including the financial cost.